If rodents make their way into your home, one of their favorite spots to shack up will be your attic. This is because it is removed from your daily activity, and provides a warm shelter that’s close to a large food supply. However, if you allow rodents to stay in your attic, it could mean costly damages and exposure to harmful diseases like leptospirosis. 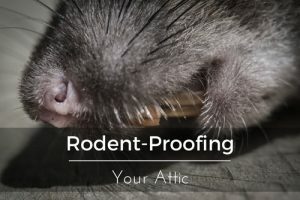 The best way to keep your home and family safe from the dangers of rodents in your home is to take proper steps towards rodent-proofing your attic. Rodent-proofing your home begins before the rodents can ever get close to your attic. The first step is to examine your roof or soffits for holes. Even if you believe the holes are too small for a critter to fit into, seal them anyways. Rats and mice can fit through holes much smaller than their bodies, while squirrels can gnaw on small holes to make them big enough to squeeze through. Rodents can also gain access to your home through your vents, so we’ve put together a list of ways you can deter rodents from your ventilation system. Place traps near the entrances of vents. This works well if you’ve seen rodents near your house, or if they are already in your vents. Protect your vent with stainless steel mesh. Cloth works well with bugs, but rodents can chew through it. With steel mesh, you can prevent the rodents from chewing their way into your vents. Sometimes even these precautionary measures aren’t enough against particularly persistent rodents. That’s when you can count on the expert assistance of Critter Control® Orlando to help remove all unwanted critters from your attic. With our state-of-the-art tools and over three decades of knowledge, we’re able to work quickly while keeping you, your home, and your family safe. And we’ll repair any of the damages the rodents left behind in your home. For your free consultation, call us today at 407.295.7194.